Things have been busy here at Worldwide Wacko Watch. From Chatham, Illinois we have a report of a Bigfoot print in a man's back yard. Michael Patrick, a resident of Chatham, was having his pool liner replaced one day when the workmen noticed a huge footprint underneath a nearby apple tree. The print turned out to be eighteen inches long, which is literally a Big Foot -- Shaquille O'Neil's size 23 shoes accommodate feet about fifteen inches long. Apparently, the previous evening, Patrick had become aware of something bumping around outside. Bigfoot expert Stan Courtney was called in, and said that Patrick wasn't the only person to have odd experiences in or near Chatham -- that there had been about a half-dozen reports of noises, including bumps, footsteps, and howling. As far as why Bigfoot picked Patrick's back yard, Courtney speculates that it is because Bigfoot likes apples. "The apple tree might have somehow been interpreted as a gift of food," Courtney said. "A creature such a Bigfoot will usually return the favor if offered food, and present a gift of its own as a show of appreciation in the form of a dead animal or a strange arrangement of flowers." So, Bigfoot's approach is kind of like that of the creepy guy in the apartment down the hall, when he asks you for a date. I'm not sure if that's reassuring, or just disturbing. Next, we have a report in from Asia, that populations of geckos in the Philippines are crashing because poachers are catching them, drying their bodies, and selling them to purveyors of traditional medicines in Malaysia and Thailand as an aphrodisiac and a cure for impotence. Apparently, an 11-ounce gecko can bring in more than a thousand dollars. Authorities are trying to do what they can to stop the trade, as geckos are valuable for keeping down populations of harmful insects. Environment Secretary Ramon Paje earlier warned that collecting and trading geckos without permit can be punishable by up to four years in jail and a fine of up to 300,000 pesos ($6,900). So, if you have trouble in the romance department, you might want to think twice about snacking on local lizards. The same advice applies if you would like to save 15% on your automobile insurance. And of course, we just couldn't call the day complete without an appearance of Jesus' face somewhere. The latest appearance of the Lord and Savior was on a Walmart receipt in Anderson County, South Carolina. Jacob Simmons and his fiancée, Gentry-Lee Sutherland, had just returned from a shopping trip to Walmart, and the receipt for their purchases fell to the floor. A couple of days later, after a church service, they happened to notice the receipt, and found that there were dark markings in the shape of a face on the slip of paper. "The more you look at it, the more it looked like Jesus, and it was just shocking, breathtaking," Simmons said. Sutherland agreed, and referenced the sermon they had heard at church that Sunday. "We had a message on knowing God, abiding in him," Sutherland said. "(The preacher asked) 'If you know God, would you recognize him if you saw him?'" Me, I'm not seeing Jesus here, but I do see a fairly strong resemblance to the character Torgo from the abysmally awful 60s horror movie Manos: The Hands of Fate. In fact, I keep expecting him to say, in a creaky voice, "Master... doesn't like... children." So, anyway, that's the wrap-up for today from Worldwide Wacko Watch. 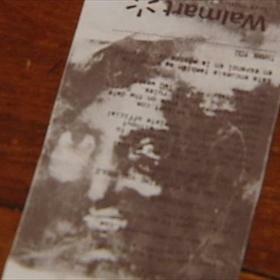 Bigfoot in Illinois, geckos in Malaysian love pills, and Jesus on a Walmart receipt. As usual, our motto here is: All the news that's fit to guffaw at.